Thank you, this is very clear and helpful (and quite generous on your part). Excellent job! I have found one thing that can simplify the process even further. After you load the CM7 zip file onto the microSD card in video 2, you can then also load the gapps-gb-20110307-signed.zip file onto the microSD card, too. They will then both install in one step rather than having to install CM7 and reboot into recovery (my NC almost always refuses to boot into recovery). I verified this by watching the text that scrolls down the screen as CM7 initially installs. Towards the end of that process, it announces that it is looking for a gapps...zip file, and not finding one, goes on to finish the first stage. So, when I copied both zip files during the same step, when the CM7 install script executes, it FINDS the gapps...zip file and happily installs it. I have done this on 3 separate complete installs and it works flawlessly every time! B&N Update Issue: The new upgrade to the NC firmware version 1.2.0 (handcuffed FroYo) that B&N is pushing out DOES NOT work with update-cm-7.0.0-encore-signed.zip, at least not for me. The NC just gets trapped in a boot loop. But the Cyanogen Team came to the rescue on April 25 (wasn't that the BN 1.2.0 update release date?) with update-cm-7.0.2-encore-signed.zip. Version 7.0.2 plays well with the BN update, and you can still use the time saving step I indicated above. 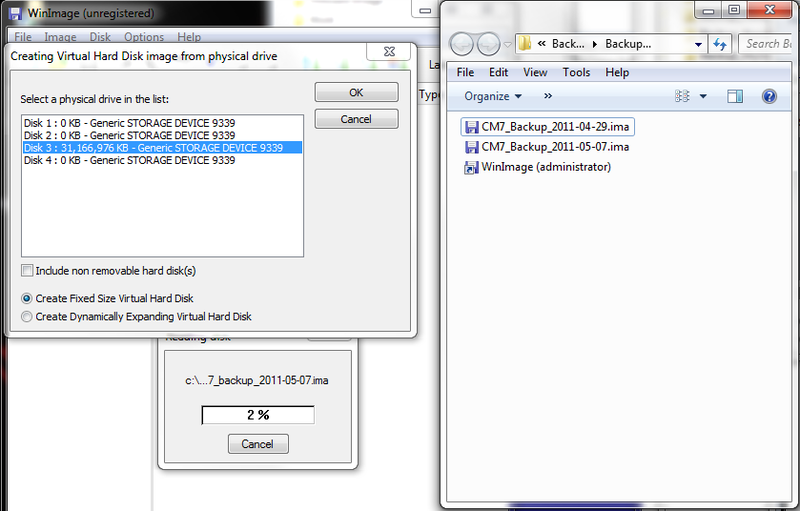 UPGRADE WARNING: For me, just upgrading an existing CM7 7.0.0 microSD card to 7.0.2 did not work. I still got stuck in a boot loop. My advice, back everything up to your PC, then do a quick format of your microSD card and to a clean install of 7.0.2 to your card. Then restore your settings, apps, etc. I hope this adds in a small way to the tremendously valuable videos you did. I've tried this method twice and it keeps stopping on the android loading screen. How do I fix this?? I am using a 16gb SD. The first steps it works perfectly but when I try to reboot it for the first time it won't go past the android loading screen. By "android loading screen" do you mean the blue CM7 mod splash screen? That one does take awhile to load, and I think sometimes it goes to sleep while loading. Have you tried touching the 'n' hardware button to wake it up? Or do you mean it's stuck at the tiny "ANDROID" text screen? I looked at the update 7.0.0 file that is linked to "here" but there looks to be a newer one 7.0.2. Which do I use for this install? I have the B&N version 1.2 running. Is this going to work with 7.0.0? Or even 7.0.2? The Android name that appears in blueish green on the side of the screen before it loads the CM7 animated startup screen. Very nice!... all in one place and very concise ... I trying this approach tomorrow! I'm honestly not sure what could cause this - but maybe you could try another SD card? If that one works, then it's probably an SD card issue. If you've done previous modding of your Nook, you could also flash back to the 1.1.0 firmware (see #2 in the credits part of the post), and try from there. Once CM7 is loaded, you can always boot up the stock app and update that as needed. Thanks! This was terrific. I had some trouble with the recovery mode. I'm glad you explained and showed it's tricky. nevermind, I used Quixny's instructions. They worked! If there are any other tips/tricks, please post them. I find the forums with thousands of posts hard to navigate. A word to all about micro SD card brands. I have used SanDisK and PNY cards, both brands Class 4 for speed. Never had a problem with either brand (about 4 of each at this point)--your mileage may vary. Posts on other forums seem to indicate that for this kind of use, you don't want to get a cheapy brand. Go with the quality labels. I am new at this. Will this CM7 work on a version 1.2 Nook Color? I think this process works with 1.2 right "out of the box", as it were, but I haven't tested it. (I had a 1.1 NC, performed the CM7 process, and then updated to 1.2 NC.) If you wanted to do it that way, the easiest thing to do would be to flash your NC back to factory defaults (see my Credits #2 point) and then do the CM7 process. But I don't think that extra step is necessary. What SD card do you suggest that will be big enough to store tons of books? So does that mean I will not be able to use NC's internal memory? It doesn't look like you can access the NC internal memory from the CM7 boot - at least, I can't figure out how to. If you want to get a 32GB card, you almost certainly won't have space problems. However, in terms of "just books", you really probably will only need 4-8 GB, maximum - my current library is 700+ titles and takes ups about 3.5 GB. Obviously apps and other Android goodies will need some extra space - maybe a 8-16 GB card would be best if you don't want to splurge on the 32GB. Hi..im new to this i have watched your videos and want to do this. However, i see now ther is another update 7.0.3. Should I use this? on the link to the gapps download i did not see 7.0.2 are all other links still there?